With the Queen's Jubilee only a few weeks away, King Sedgewickson and his lovely wife, Queen Gertrude, have compiled a list of possible gifts for this year's Fealty Ceremony and posted it in the castle's plaza. Craftsmen and women from all over the kingdom are now hard at work, striving to be the first to craft five items from the list and win the honour of standing side-by-side with the royals as the gifts are presented to the five Dukes at The Queen's Jubilee. 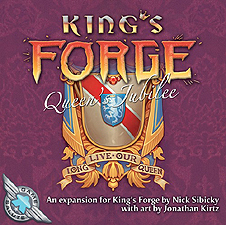 This is an expansion and requires King's Forge to play.